This tool was developed as part of a case study in the SIMCelt project to understand the concept and application of Ecosystem Services for MSP in a transboundary context by using existing and readily available datasets. The tool seeks to help marine planners understand and apply Ecosystem Services in a practical way. It therefore uses three types of data sets to map ecosystem services including provision, regulatory and cultural services in a transboundary context (Celtic Seas). It also illustrates how different data sets can be used to map ecosystem services for decision making in transboundary MSP. How do you use readily available data in an Ecosystem Based Approach to Decision Making? What are the recommendations for incorporating ecosystem services analysis into MSP? The Storymap (tool) was developed as part of a case study of the the SIMCelt Project. Although the data used by the tool had already been inherently harmonised across the OSPAR Region III: Celtic Seas region, all spatial datasets have their limitations and need to be interpreted with caution. However, there is much potential for using existing authoritative spatial datasets (such as ICES or EMODNET data) to help marine planners incorporate ecosystem services to achieve an ecosystem-based approach to decision making. 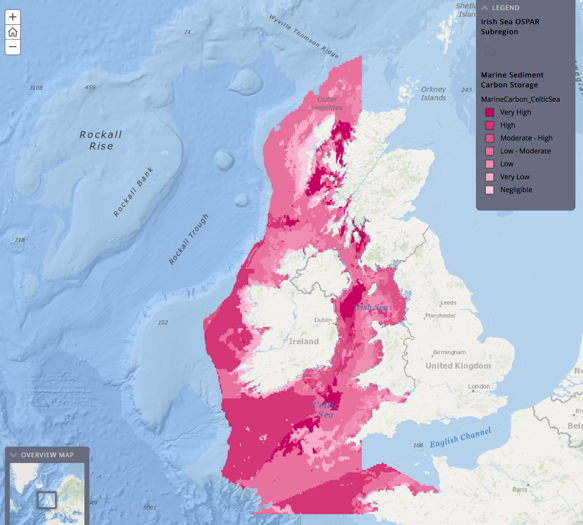 This tool was developed by the Department of Agriculture, Environment and Rural Affairs (DAERA) who are the maritime planning authority for Northern Ireland but has not yet been applied in any of the national MSP processes in the Celtic Sea. The case study presents the ecosystem service concept in a sufficiently practical way so that it can be understood and applied by maritime planners. In order to achieve this, the case study focuses on the use of existing and readily available datasets in an ecosystem-based approach to decision making, through an example of Provisioning, Regulating and Cultural Ecosystem Services evaluation. Provisioning Ecosystem Services: International Council for the Exploration of the Sea (ICES) data was used to measure the relative importance of fishing areas across OSPAR Region III: Celtic Seas as well as the economic values of certain types of fishing activity (Nephrops fishing activity landings value in Euros). Data from the ICES vessel monitoring system and logbook data for vessels using mobile bottom contact gears were used to identify areas of pressure onto the seabed. 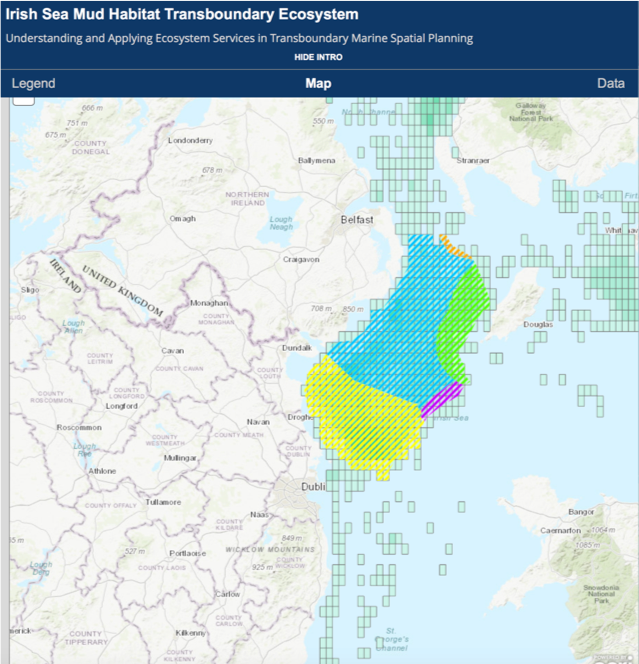 The tool also includes maps of the Irish Sea Mud Habitat as an example of a how harmonised datasets are useful and necessary for managing marine ecosystem that extend beyond several jurisdictional boundaries. 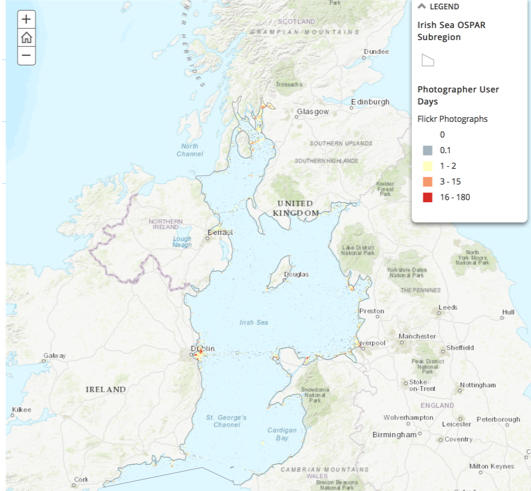 The slider bar that appears when looking at the Irish Sea Mud Habitat map allows the user to view the jurisdictional boundaries and the transboundary nature of this ecosystem. Regulating Ecosystem Services: The modelled EMODNET Seabed Habitat data sets were used to map out Marine Sediment Carbon Storage. This information, despite being based on models, is intended to aid decision making, considering the ecosystem service benefit of marine carbon storage towards mitigating climate change, and seeing how it varies across the various sediment types of the Celtic Seas. As seabed mapping studies improve over time and cover more of the ocean floor, the maps can be updated. Cultural Ecosystem Services: Cultural ecosystem services are difficult to define, map and quantify. 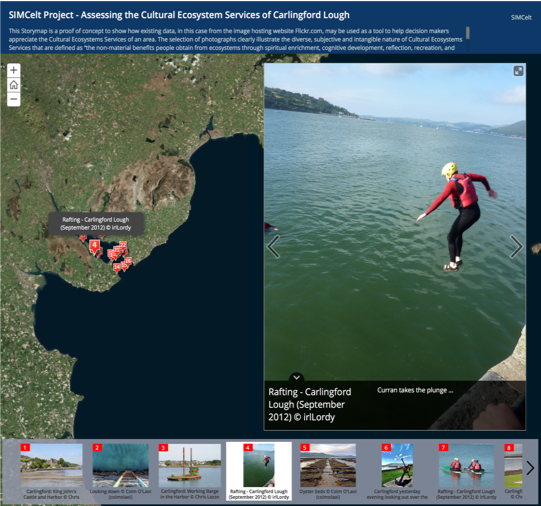 This tool used social media to give an insight into the cultural value of the ecosystem services of a transboundary area (Carlingford Lough) of the Irish Sea. Images and vidoes along with their geolocation, of the Carlingford Lough where taken from sources like Flickr, Instagram and Twitter, etc. With this information the frequency and number of images/day was calculated and plotted geospatially into maps. However, this information is only available by accessing Instagram and Twitter through a personal account. The maps and analysis of data show how the cultural ecosystem services decreases as you move away from the coast. The main output from the case study was an interactive Storymap, which uses an Open Source Esri/Arcgis template to combine text and images alongside a series of interactive maps to explain various aspects of the ecosystem services and decision making in MSP. Results from the case study analysis shows that all spatial data sets must be used carefully and the user should always be clear about why and how the dataset was created and understand its limitations. 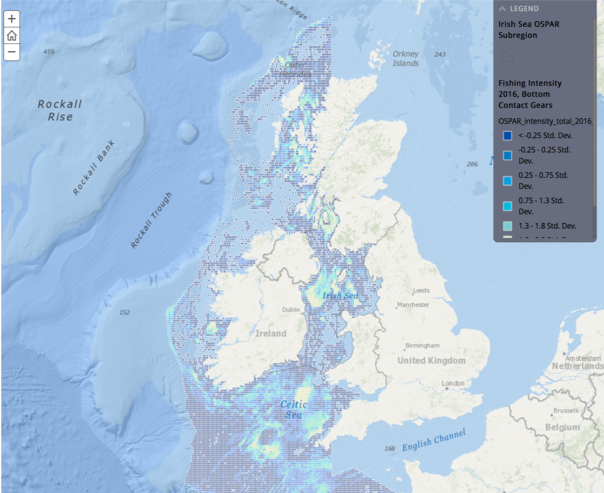 The Storymap demonstrates that there is much potential for existing marine spatial data sets to be used to help marine planners incorporate ecosystem services to make informed and balanced decisions. The tool and data sets used at the case study are specific to the Celtic Sea. However, the methodology applied for creating the storymaps and analysing ecosystem services can be used in other areas through the use of the Esri/Arcgis template . The harmonised data used are also readily available for other parts of Europe through ICES and EMODNET.